Heat jaggery in a pan with water till it immersing level. Switch off the flame once slight honey like consistency is reached. Strain the jaggery water using a filter to remove impurities. This step is completely optional. Take 2 tbsp of poha cereal mix in a saucepan. Add ¾ cup of water and mix well with a whisk. Make sure there are no lumps remained. 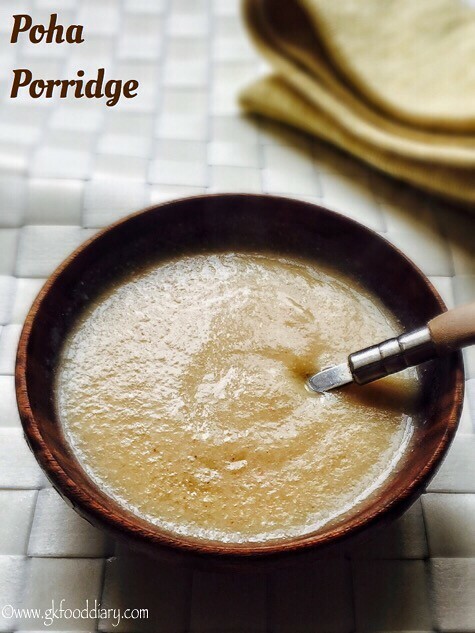 Cook the porridge for 5 minutes until it becomes slightly thick. Now Add ghee and jaggery syrup/salt at this stage. Give a quick stir.